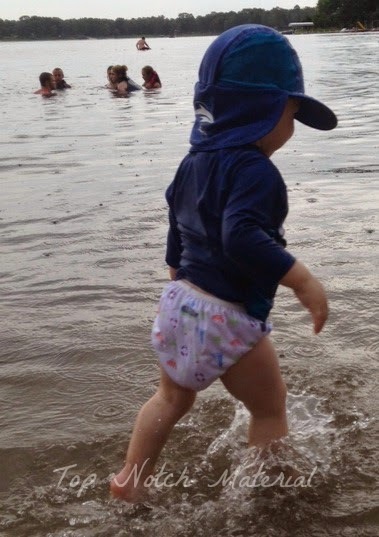 I usually purchase disposable swim diapers for my little man, but as a former cloth diapering mommy, I have been interested in swim diapers and how they might work for him. I recently got in touch with BabyKicks and asked to review their Swim Diaper and they agreed to send me one! 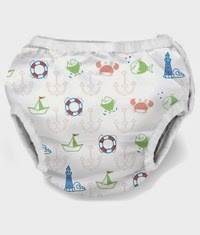 At an affordable $13.95 a diaper, it is only a little more expensive for one pack of swim diapers. "Our swim diaper is made with a single layer of soft & stretchy PUL and lined with a comfy mesh to catch anything your baby throws at it. The soft elastic fabric around the legs and waist provides excellent security and comfort with freedom to move. The snaps on the side allow for easy changes and you’ll save money reusing this adorable swim diaper everywhere this summer! Psst: you can even use this Swim Diaper for potty training"
Even though my little man is only just over 30 pounds, I went ahead and asked for an XL diaper which is made for 35+ pounds. My little guy is going through a major growth spurt right now and I know it will be a very short amount of time before he is up to 35 pounds. Needless to say, this diaper is just a little too big for him, but it did not get in the way with the functionality of the diaper at all. He wore this for several hours while we were at the lake and had no issues at all! Paired with his UV swim shirt and hat, it makes the perfect swim outfit for those hot, Florida summer days. The unisex print is great for both boys and girls, though I love it for my litttle boy most! This Diaper has been great for us and will save us a lot of money over the course of the summer! I love that it can also be used for potty training too! Be sure to check out BabyKicks on facebook too for the latest on cloth diapers and cloth swim diapers!